A russeted brown-skinned Asian pear. 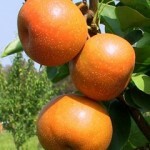 The medium to large fruit ripens in mid-September. It is a very productive tree: it needs a pollinizer. Budded on semi-dwarf root stock. They need full sun and a well-drained soil. Obtain local advice for more cultural information.